Formulas let you create custom summaries based on calculated values using report data. These formulas can then be used as columns in your report. 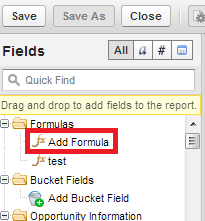 To add a new formula to a summary or matrix report, double-click Add Formula. Once you define it and click OK, it's automatically added to the preview as a column for summary reports, and a summary field for matrix reports. With joined reports, you can add either a cross-block or a standard custom summary formula.